Dr. Joel Moake specializes in fundamental studies of platelet function. His group was the first to describe basic mechanisms of platelet adhesion and aggregation under high shear stress; systemic platelet aggregation in the most extreme platelet clumping disorder, thrombotic thrombocytopenic purpura (TTP); and renal platelet thrombosis in a common cause of acute kidney failure, the hemolytic-uremic syndrome (HUS). Dr. Moake’s Laboratory in Hematological Research focus on the molecular events associated with TTP and HUS —especially, the interaction between the adhesive multimeric protein, von Willebrand factor (VWF), and the VWF-cleaving metalloprotease enzyme, ADAMTS-13. His long-term goal is to translate basic research observations obtained in the study of these severe, paradigm platelet clumping disorders into the development of novel therapeutic strategies for the treatment of common, localized thrombotic processes that are characteristic of heart attacks and strokes. 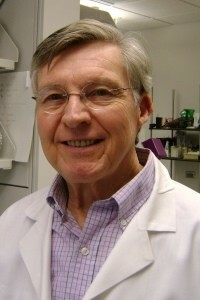 In recognition of his research accomplishments, Dr. Moake is an elected member of the American Society of Clinical Investigation, an elected member of the Association of American Physicians, a fellow of the American Institute for Medical and Biological Engineering, and a fellow of the American College of Physicians. He is also a founding member of Rice University’s Department of Bioengineering undergraduate and graduate programs.